YARRAM, SOUTH GIPPSLAND, VICTORIA, AUSTRALIA. .... a delighful place to live, an exciting place to visit. Yarram is a delightful town of some 2,000 people in south eastern Australia, in a region called Gippsland in the state of Victoria. The town grew as a result of the rich dairy country that supplies milk products to Australia, and to the timber industry. Yarram is 221 kilometres east of Melbourne, accessible either on the Princes Highway (turn south at Traralgon), or the most picturesque South Gippsland Highway which runs through town on its way to Sale. It is a quiet town, a comfortable place to live, with excellent nearby attractions such as Port Albert, the Tarra Valley, the start of the Ninety-Mile Beach and a number of forests containing a variety of life. 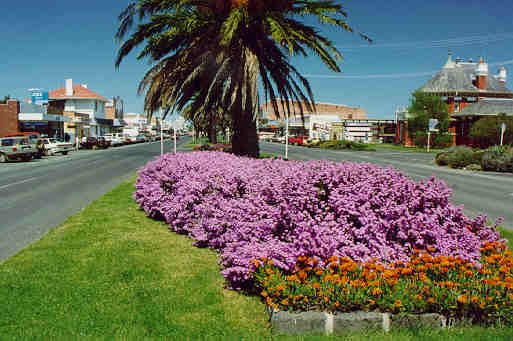 The town boasts the annual Tarra Festival at Easter with a street parade, art exhibitions, a race meeting, and a country fair. There is ample accommodation in the region, such a motels, hotels, and bed and breakfast establishments. A full range of shops is available in the main street. The town is also proud of its health service and hospital, one of the finest in rural Australia, its schools, churches and sporting facilities. Left: Commercial Road, the well maintained main street of Yarram. 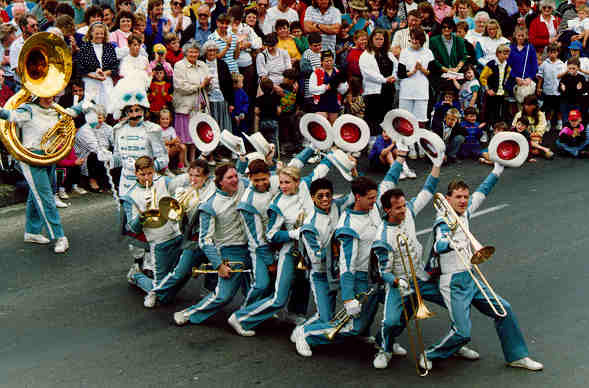 Right: Tarra Festival street parade at Easter each year. You won't starve in Yarram..... the town offers several cafes, restaurants and a bakery. This is what popular food critic Stephen Downes wrote in April 2008 after a trip through Yarram. "The following morning in Yarram I was served the best bacon and eggs I can recall. Jenny Gierens at the Federal Coffee Palace bakes amazing cakes and pies, but what I ate was a huge amount of brilliantly cooked, rich and tasty rashers, two flavour-filled eggs with yolks of an intensely luminous orange-yellow colour on two slices of what seemed to be fat-drenched French toast. Don't dismiss eating like this. With fruit for lunch, theire is no need to eat before 7pm or later." The Federal Coffee Palace Restaurant (and winebar/cafe) is at the southern end of the business strip of Commercial Road, opposite the Mobil garage, park and DCNR building. The YARRAM and PORT ALBERT homepage provides the links to all services.